Planet LA and friends are pleased to hold our annual holiday party on Friday December 11, 2015 from 7-10pm at the grand new Whole Foods Market in downtown LA. Festivities will take place in the elegant Eight Bar inside the store at 788 S. Grand Ave. Los Angeles, CA 90017. We will also have a food drive supporting the LA Mission. Our brand partners are generously offering prizes and samples. Special thanks to our brand partners at Whole Foods Market, TC Electronic, Studio Malibu, Teas’ Tea, Hubert’s Lemonade, Organic Affinity, Vita Coco, Jackson’s Honest Chips, Chamelon Cold Brew, Justin’s, Cappello’s, Good Pop and more. 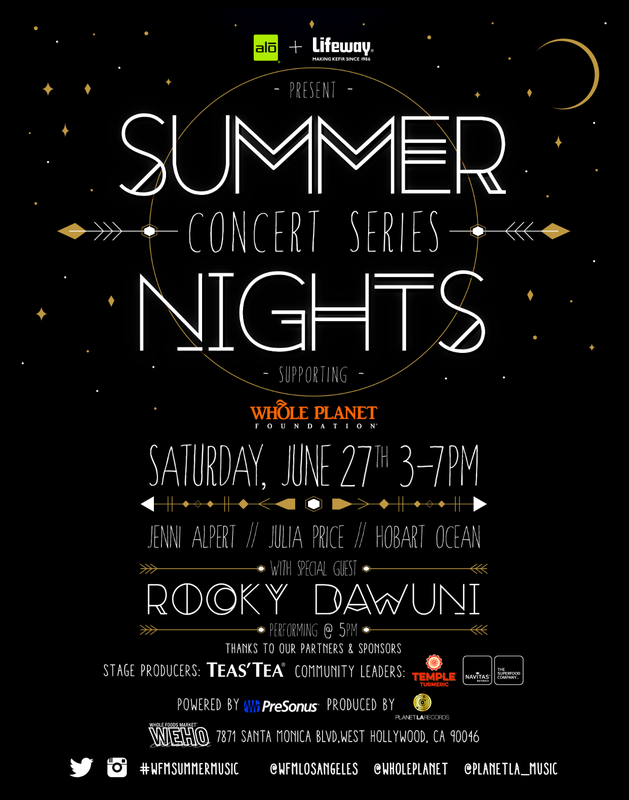 We’re excited to produce another Summer Music Series at Whole Foods Market West Hollywood (7871 Santa Monica Blvd), in support of the Whole Planet Foundation presented by ALO Drinks & Lifeway Foods. The Series will kick off on Saturday, June 27 from 3-7pm featuring performances by Rocky Dawuni, Hobart Ocean, Julia Price and Jenni Alpert. Free samples from our partners at ALO, Lifeway, Teas’ Tea, Navitas Naturals and more. Powered by PreSonus and produced by Planet LA Records. Upcoming dates: Saturdays, July 25, August 22 and September 12.